This is one of the oldest recipes we published on the web. It didn't attract the attention it deserved, the photos were… well… not our best moment, so we decided to refresh this post, take new pictures and introduce to all of you one of our best dishes: Wine crust fried mushrooms, with garlicky mashed potatoes on the side! Our favorite mushrooms for this dish are the Portobello. You can also use large common mushrooms, pleurotus, or other medium-large sized mushrooms you prefer. This is a vegetarian recipe that wins the hearts of all non-vegetarians as well, because it tastes fantastic, the texture resembles a bit the meat, and it’s very filling. In order to form the crust, we make a watery batter consisting of beaten egg, flour and white wine. No water is added in this recipe. 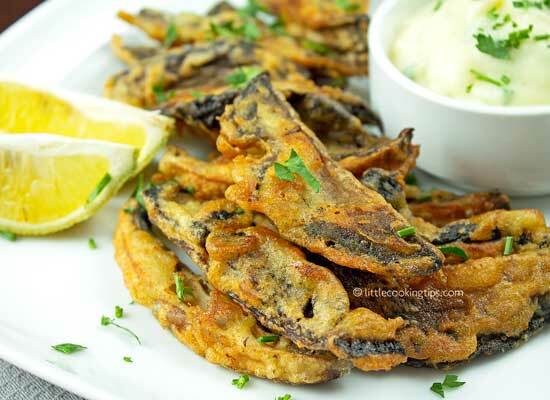 Then you simply dunk the mushrooms (you can cut them in slices, or in any form you prefer) in the batter and fry them in olive oil (medium-high heat). The olive oil in this recipe provides a fantastic taste. In 3-4 minutes (flipping once half way through) a beautiful golden crust is formed. Yummy! To accompany this, we suggest garlicky mashed potatoes. You can serve the mashed potatoes with small chunks left inside, or you can use a hand blender or a food processor for a smooth result. Choose whichever you prefer. Parsley is added in the end result for freshness, which is needed due to the frying food it accompanies. So let's see how to make this delicious treat! - Olive oil for frying the mushrooms (about 250ml / 1 cup). You don't need to use extra virgin which is expensive here. The first step is optional, but if using Portobello we think the taste is better. Peel the top and then carefully remove the black gills from the mushrooms with a teaspoon. (pic. 1 & 2). Remove the stems as well. Cut the mushrooms in slices /chunks with a sharp knife (pic. 3 & 4). Put the olive oil in a frying pan (you will need about 1.5cm/0.5inch of oil in the pan) and put it on medium to high heat. Take the bowl with the batter close to the pan. Put the mushrooms slices into the batter to coat, drain the excess batter well (tap them) and place them in the pan. (pic. 6). Don't add them all at once, and don't overcrowd the pan. It will take 3 batches to fry them all. Fry the mushrooms until golden brown on both sides (pic. 7), for 3-4 minutes, flipping once. Remove from the pan and place them on a large dish with kitchen paper to absorb the excess oil. Peel the potatoes and chop them into pieces (4-5cm/1.5-2inches each). Put them in a saucepan/small pot, cover them with salted water and put it on high heat. Once it starts simmering, reduce the heat to medium and let them boil for about 20-25 minutes. Once boiled (you should be able to pierce them easily with a fork), remove them from water with a slotted spoon and place them in a bowl. Mash the potatoes with a hand blender or with a large hard ladle or the tool for mashing. Add the butter and stir so it melts. Continue stirring and slowly add the milk. Add the garlic, and the nutmeg, salt and pepper. Stir again and finally add the parsley. Ready! Serve the mushrooms with the mashed potatoes on the side. Kali oreksi! 1.You can save more time if you start boiling the potatoes, while you fry the mushrooms. 2. It's better, before you start cooking, to prepare and gather all the ingredients. The cooking will be a lot easier this way. 3. When serving, you can add a few drops of fresh lemon juice on the mushrooms if you like. In our opinion it adds freshness and flavor. 4. You don't need to use extra virgin olive oil that's more expensive for frying the mushrooms. 5. You can also serve the mushrooms with authentic tzatziki or skordalia. These combinations are again, divine.